Argument scholars have articulated a conception of argument skills that can be used to examine the relation of meta-cognitive knowledge to skillful argument use. Walton (1989), for instance, suggests that skillful argument includes proving your own thesis, challenging your opponent’s claim and reasoning, and honestly responding to your opponent’s challenges. Van Eemeren and Grootendorst (2004) believe that to be a reasonable discussant, one should at least defend one’s standpoint with relevant argumentation, applied with appropriate argument schemes, clear formulations and without falsely attributing starting points or unexpressed premises to one’s opponent. Applying a constructivist framework, four competence issues could be conceived in relation to any specific argument skill. These include the nature and forms of specific functional competencies, such as what counts as skillful argument; the determinants of skillful behavior for specific competencies, such as the abilities and motivations necessary to engage in argumentation; the antecedents of specific competencies, such as socialization experiences related to argument skills or educational efforts designed to cultivate argument skills; and finally the consequences of individual differences in specific competencies, such as the effects of particular argument skills (Burleson, 2007). Most constructivist research has focused on social perception and the message production process. Individual differences in social knowledge (such as cognitive complexity) have been found to be positively related to integrative and person-centered message strategies in a variety of communication contexts (see the review of Burleson & Caplan, 1998). That is, communicators with highly complex cognitive systems are more likely to design persuasive and behavioral change messages that acknowledge, legitimate, and elaborate on the desired individual attributes of the interactants. Extending the constructivist framework to argument skill, constructivist theorizing could focus on identifying important activity types relevant to argument (such as facilitating behavior change) and relevant issues within these activity types; theorizing could also examine the role of reasoning in constituting taken as shared understandings in argument activities (Taylor, 1992), as well as focus on the role of reasoning for designing person-centered and integrative messages that facilitate argument acceptance. It is the last skill that is the focus of this empirical study. Differences in the extent to which arguers reflect on matters of evidence and proof to provide the best justification for their claims may affect how arguers design person-centered and integrative messages to facilitate audience acceptance of their arguments. Two programs of research on intellectual development are relevant to theorizing the relationship of meta-cognitive knowledge about argument and argument skill. One research program is that of Deanna Kuhn and her colleagues (e.g., Kuhn, 1991, 2005; Kuhn, Goh, Iordanou & Shaenfield, 2008; Kuhn & Udell, 2003). Kuhn contends that intellectual development includes the development of both inquiry and argument skills and should be the aim of education because these skills prepare students for thinking and citizenship in a democratic society. In Kuhn’s model, argument skills comprise activities such as generating, elaborating and developing reasons into arguments, evaluating reasons, generating counterarguments and rebuttals, and conducting two-sided arguments. Focusing on middle school students, Kuhn and her colleagues have documented age-related changes in argument skills, and they have also shown that at risk students can be trained in argument skills (Kuhn, 2005; Kuhn & Udell, 2003). A second program of research on intellectual development has been the work of King and Kitchener (1994). Their Reflective Judgment Model is situated within the cognitive-developmental tradition, and describes developmentally ordered changes in individuals’ epistemic beliefs about knowledge and knowing, and how these beliefs are reflected in the way beliefs about controversial issues are justified (Kitchener, King & Deluca, 2006). Among young adults, pre-reflective thinking is characterized by justifying views with authorities or personal opinion, quasi-reflective thinking is characterized by beginning to use evidence to justify beliefs, and fully reflective thinking is featured by comparing evidence, reasoning and opinions from different perspectives. King and Kitchener (1994) provide extensive empirical support for their Reflective Judgment Stage Model on controversial scientific issues. In a similar but separate line of work, Kline has sought to pinpoint specific relationships between meta-cognitive abilities and argument skill. In a series of studies (Kline & Chatani, 2001; Kline, 2006, 2010, Kline & Delia, 1990) Kline has examined high school and college students’ abilities to analyze regulative and persuasive messages. She has found systematic age-related changes in meta-cognitive knowledge about regulative messages. She has also found that advanced message monitoring is positively related to person-centered regulative message strategies. That is, in situations calling for behavioral regulation and persuasion, those who had advanced message monitoring also produced persuasive arguments that legitimated and elaborated upon the message recipient’s feelings and beliefs. The purpose of this empirical study is to apply King and Kitchener’s (1994) framework to examine the relationship between an arguer’s ability to reflect upon evidence and reasoning (called here reflective reasoning) and the arguer’s ability to engage in particular argument skills. While King and Kitchener’s (1994) focus has been on young adults’ reasoning about scientific problems, the focus here is on analyzing the everyday arguments of young adult friends. Reflective reasoning at higher levels is expected to be linked to arguers’ verbal abilities to reason about opposing points of view, as well as arguers’ verbal abilities to legitimize and individuate opposing points of view. H1: Reflective reasoning is positively associated with arguments expressed in person-centered messages. H2: Reflective reasoning is positively associated with integrative reasoning acts. H3: Reflective reasoning is negatively associated with negative emotions expressed in resolved disputes. RQ1: What topics and themes characterize the resolved and unresolved dispute narratives of young adults? Participants were 60 undergraduates (14 males, 46 females) enrolled in two communication classes at two Midwestern U.S. universities. Approximately 15% of the students were Hispanic, African-American or Native American; the other students were Caucasian. In exchange for course credit, participants completed a lengthy written questionnaire about three types of disagreements (see the Appendix for scenario descriptions). Participants first read a true story about two grandparents and three of the five grandchildren they were raising. The oldest grandson, a college dropout, had expressed negative opinions about grades and work habits that the grandparents didn’t want to adversely influence their younger twin grandsons, who were successes in school and athletics. Participants were asked to write down what the grandparents should say in the situation to their grandchildren. This regulative communication situation was used to measure person-centered regulative communication skill. Participants were also asked to provide narratives of two disagreements with friends; a disagreement that was successfully resolved and a disagreement that was not successfully resolved (See the Appendix for a fuller description). Participants indicated the specific arguments and reasoning used to resolve both dispute types. After each scenario, participants were asked specific questions about how they reflected on the best arguments to use in the scenario. These questions employed ideas from King and Kitchener’s Reflective Judgment Interview (1994). After the first scenario, participants were asked how it is possible that communication and parenting experts disagree about how best to handle this type of situation, and given experts’ disagreements, how one determines how best to handle the situation. After the second and third scenarios, participants were asked (a) if it was the case that one point of view was right and the other was wrong, (b) how could we say that one opinion or point of view is in some way better than the other in the situation, and (c) how is it possible (or not) to determine that your final position on the issue would be correct. Four measures were constructed to assess the research hypotheses. A first measure assessed participants’ Reflective Reasoning, and was formed from an analysis of the participants’ reasoning about their interpersonal arguments they used in the two disputes they resolved successfully and unsuccessfully. Based on King and Kitchener’s (1994) work, responses were analyzed for the extent to which they generally fit the Stages of Reflective Judgment, but the measure was adapted to fit the interpersonal disputes described by the participants. Employing King and Kitchener’s (1994) stage reasoning, participants’ responses ranged from Stage 3 to Stage 6. Some participants saw points of view as relative and fitted to their feelings in the situation without a clear link between evidence and belief (Stage 3; e.g., “I think I was right, even if Catie is independent it’s just stupid to walk home alone”). Other participants saw their points of view as based upon evidence and reasoning, but in a comparison the best evidence and reasoning fit the participants’ feelings (Stage 4; e.g., “Experts may disagree because different approaches may create different outcomes; I would try to satisfy all the parties”). Some participants recognized that beliefs should be evaluated with “rules of inquiry for that context and by context-specific interpretations of evidence” (King & Kitchener, 1994, p. 65, Stage 5; e.g., “Generally no one is entirely right or wrong, but when one person’s choices negatively affect the other person so the first person can have what they want, it is ‘wrong.’”), while a few recognized that beliefs are evaluated with criteria such as with “the weight of the evidence, the utility of the solution, and the pragmatic need for action” (p. 69, Stage 6; e.g., “I would probably recommend an integrative approach as researchers seem to agree that direct and constructive ways to dealing with conflict are more likely to work”). Reflective reasoning differed in the extent to which participants talked abstractly about features of evidence and reasoning in relation to the specific context. Reflective reasoning was assessed for participants’ reasoning about best viewpoints in their successful and unsuccessful disputes, and these were averaged to form a measure of reflective reasoning (alpha = .85, M = 4.08, SD = .844). A second measure focused on the regulative messages produced in response to the regulative communication scenario involving the three grandchildren. The regulative messages the grandparents expressed to the oldest grandson was analyzed for its level of person-centeredness using the nine level regulative message coding hierarchy developed by Applegate (1980) and used by constructivist communication researchers to measure person-centeredness in regulative communication situations. Each regulative message was analyzed for the extent to which it legitimized and elaborated the interactants’ perspectives in reasoning about effective and appropriate conduct in the situation. At the first major level of the coding hierarchy participants denied the legitimacy of the interactants’ perspectives as they discussed the children’s conduct, either with coercion, criticism, threats, or commands, and/or through application of situational directives or rules (e.g., “Max, that is disrespectful behavior…” “You need to respect your boss”). At the second major level participants implicitly legitimized the interactants’ perspectives by providing simple or multiple consequence reasoning or (e.g., “If you go back to school you can earn a degree where you can be the boss and make the rules”), or non-feeling centered explanations of the context or application of general principles as the basis for appropriate conduct (e.g., “Everyone has a purpose and each person will have a different path”). At the third major level participants explicitly acknowledged and individuated the recipients’ perspectives (e.g., “Max, the boys look up to you. Why would you say that grades, even in middle school, do not count?”), or elaborated and/or coordinated the interactants’ perspectives in crafting a rational basis for behavior (e.g., “It’s not that your brother is wrong…but grades and achievements DO count. Do you think you would ever be soccer stars if you never touched a soccer ball until you were in high school? The same goes for your grades. You’re learning the information that is necessary to learn the harder stuff in high school. We know you’ll keep doing your best. At this rate you’ll be achieving your dreams like it’s nothing!”). Participants’ messages were analyzed for the highest level attained on the coding hierarchy; these responses ranged from 3 to 9 (M = 6.17, SD = 1.82). A third measure focused on the integrative reasoning employed by the participants in each of their dispute narratives. Reasoning that explicitly extended or critiqued the reasoning of the other’s standpoint in ways that linked that standpoint to the participant’s standpoint was counted; this measure incorporated what Berkowitz and Gibbs have called transacts (Berkowitz & Gibbs, 1983, 1985). Reasoning that invited a mutual solution or integrative standpoint, showed how a line of reasoning would benefit the other or how the other person’s reasoning linked to their own reasoning were counted. For instance, in one narrative the participant proposed to the other that “he should put himself in his friend’s shoes to decide whether or not…” while in another narrative, the participant “tried problem solving and told him he could drop [the fliers] off after class.” The number of integrative reasoning acts was summed for each dispute narrative (Ms = 1.83 & 1.20, SDs = 1.15 & 1.27, for resolved & unresolved scenarios, respectively). The last measure was the number of expressions of negative emotions (e.g., anger, frustration) explicitly stated by each participant in each dispute narrative. An emotion term was counted if the participant described their own negative emotions or emotional expressions (e.g., “I was extremely frustrated,” “Furious, I explained how upset I was”) or the participant attributed a negative emotion or negative expression to their friend in the situation (e.g., “He became angry,” “she was very hurt,” “she just kept yelling”). The number of negative emotion states and expressions was counted for each narrative (Ms = 1.28 & 1.65, SDs = 1.71 & 1.94, for the resolved and unresolved dispute narratives, respectively). The coding for each measure was completed separately after multiple readings of the questionnaires. Coding reliabilities for the measures was assessed by having a second coder blind to the study hypotheses independently code 20% of the protocols. The Cohen kappas were acceptable, with none below .68. Beside these measures, a grounded theory analysis of the participants’ narratives was conducted. The topics and themes that characterized the resolved and unresolved dispute narratives were analyzed, which involved noting the general topic of each narrative and considering how each sentence was relevant to participants’ reasoning activity. Constant comparative methods and invivo coding were used to form categories and their properties, following grounded theory procedures (Charmaz, 2006; Corbin & Strauss, 2008). Tests of the hypotheses are presented first, followed by the grounded theory analysis of the dispute narratives. The hypotheses were assessed with correlation and regression methods. Table 1 presents the Pearson correlations of the variables. The first hypothesis, that reflective reasoning is positively related to person-centered messages, was supported, for reflective reasoning was positively correlated with person-centered regulative strategies at the p < .05 level. The second hypothesis, that reflective reasoning is positively related to integrating reasoning acts, was nearly supported, as reflective reasoning was correlated with integrative reasoning acts at the p < .10 level. Finally, the third hypothesis, that reflective reasoning is significantly related to negatively expressed emotions, was weakly supported in the expected directions. Reflective reasoning was negatively related to negative expressed emotions in resolved disputes at the p < .10 level, but positively related to negatively expressed emotions in unresolved disputes (at the p < .05 level). These hypothesized relationships turned out to be weak in magnitude, except for the relationship between reflective reasoning and person-centered regulative strategies, which was moderate-sized. A simple multiple regression was then conducted to determine how person-centered message strategies, integrative reasoning acts, and negatively expressed emotions collectively accounted for variation in reflective reasoning. Each predictor variable was mean-centered prior to entry into the regression. The analysis was statistically significant, F (5, 54) = 5.153, p < .01, and accounted for 26% of the variance in reflective reasoning (R = .57). 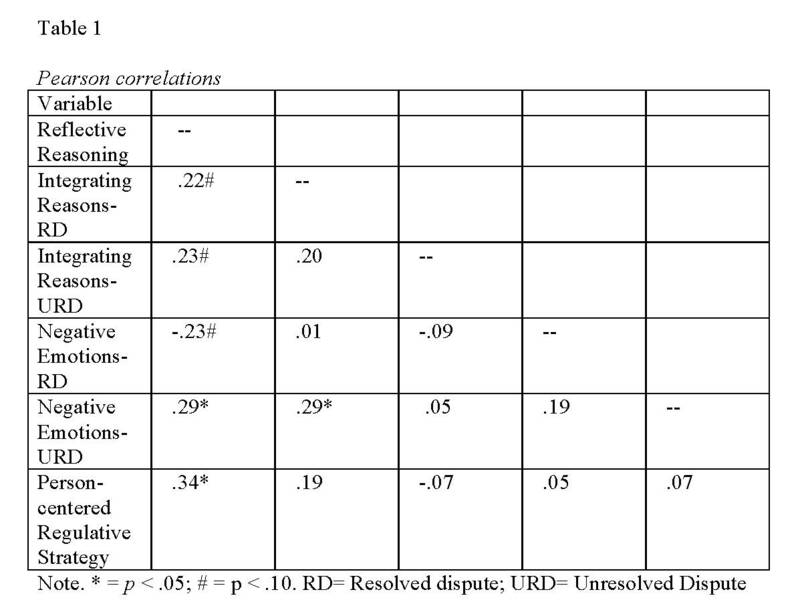 Integrative reasoning on unresolved disputes (b = .21, p < .08), person-centered message strategy (b = .35, p < .01), and negative emotions in the resolved and unresolved disputes (bs = -.28 & .21, ps < .05) were all significant (or near significant) predictors of reflective reasoning. Person-centered message strategy uniquely accounted for 12% of the variance in reflective reasoning, while negative emotions in resolved and unresolved disputes each uniquely accounted for 8% of the variance in reflective reasoning (semi-partial rs were .34, -.28, and .28, respectively; integrative reasoning accounted for 4% of the variance in reflective reasoning). Advanced reflective reasoning, then, was predicted by the ability to express arguments in person-centered messages, express negative emotions in unresolved disputes, and not express negative emotions in resolved disputes. Dispute topics. The narratives were first analyzed for the topics covered, followed by the themes that characterized the participants’ felt meaning and significance of the disputes. Resolved disputes focused on seven topics. Nearly two-thirds of the disputes were over disagreements regarding spending time or contact with one’s friend (24%), living together with roommates (21%), or lifestyle and health choices (18%). Another 36% of the resolved disputes were about money and financial responsibilities (12%), dating issues (12%), specific topics (6%) and scheduling issues (6%). Unresolved disputes focused on seven topics. Half the unresolved disputes were over disagreements about dating or impressions of the friend’s girl or boyfriend (25%) or over changes in spending time or contact with one’s friend (25%). Another 30% of the unresolved disputes were over specific issues, such as whether women should be able to get an abortion (15%), and issues over living together, such as TV watching etiquette (15%). The remaining unresolved disputes were over abusing alcohol or safety issues, such as texting while driving (9%), deception (6%), and general issues, such as jealousy or a mean interaction style (6%). A series of McNemar Chi square tests showed no significant differences between the resolved and unresolved dispute topics. Resolved dispute themes. Five themes characterized the narratives of participants who had successfully resolved their disputes with friends. Several participants (39%) reported that a key feature in resolving their disputes successfully was the role of understanding and listening. Participants considered it a success when they had constituted a mutual state of understanding and respect. As one participant put it, “We still felt we were right…but at the same time, we understood both sides so we put it behind us. Because we were able to openly communicate about our feelings for the situation and actually listen to and reason with the other person’s situation, it made for an understanding and eased the situation” (#16). Another participant described a protracted disagreement with her girlfriend over spending more time with a new boyfriend instead of her friends: “Eventually we were both able to understand each other’s point of view, even though we both still believed in our own. Because we could understand and respect each other’s opinions however, we were able to start hanging out more often while she still understood that I would be still be spending time with my boyfriend. We never changed our opinions, we just were/are able to respect each other’s opinions and change our behaviors accordingly” (#30). Participants also used the term, “understanding”, in instances when the disagreement was due to a misunderstanding of each other’s viewpoints: “By talking about the conflict we had due to a misunderstanding, we were able to correctly know what the other meant” (#13). Other participants used the terms “listening”, “trust” or “respect”: “I have the ability to listen to other opinions and arguments to make my decisions” (#31). A second theme involved participants or their friends giving specific integrative proposals to resolve the dispute (30%). Integrative proposals displayed types of integrative reasoning, compromise or appeasement. For instance, roommates with conflicting band preferences decided to play other music in their home. Roommates with unwashed dishes in the sink resolved their dispute with one participant proposing that “everyone should clean their dishes that same day, but they have the end of the night to do it” (#25). A dating couple with money disagreements decided to “set aside a certain amount of money each pay before doing anything individually” (#33). A friend with tattoo plans moved the location of her tattoo after hearing her friend’s arguments. Some of these practical solutions required face-saving efforts by one friend to enable the other friend to feel satisfied. For instance, one participant with a friend jealous of her time spent with other friends, resolved the dispute by reassuring her friend of her closeness. In another instance, a participant propelled her female friend to not walk home alone on her terms: “After I said she was being a brat and rude to Andy she finally let him walk with her but made clear to him that she didn’t need anyone to walk her home that they were just going in the same direction” (#18). A third theme involved participants using skillful reasoning or communication practices. Participants (23%) cited that the way they reasoned with their friend actively shaped the dispute resolution. For some, a “logical manner” meant also speaking in ways to preserve face and relational harmony: “I insisted on presenting the situation to her in a logical manner. Because my intention was not to prove her wrong but to maintain our relationship, I found myself being very careful with words, and also putting myself in her shoes…it worked great” (#04). Other participants recognized that being able to communicate with arguments meant that you were persuasive: “I still don’t know how I was talked into it but we ended up living with the girls. I think Miriam was a really strong communicator with her argument and stronger than me so her point of view won.” She was also very positive with the subject by constantly reassuring me that this would be a good thing so I eventually agreed” (#27). Another participant staged a campaign to convince a friend to attend a musical festival the last week of classes: “I thought my point of view was better and so I spun it into his head for a month and got him to realize it” (#28). A fourth theme that occurred in the resolved disputes was that for some participants (21%) resolving the dispute took time. The initial exchange of standpoints often was accompanied by feelings of upset, anger, frustration, after which the participants often did not speak for a time. One participant wrote about a girlfriend becoming jealous about her hanging out with others; an intense exchange led to their not speaking for three months before reconciling. Other participants noted that helping the other change his/her mind just required time. One participant focused on helping another see that his life choices needed reconsideration: “He needed to go through the belly of the best first until he could understand where I was coming from” (#12). In another instance, a participant had a disagreement with her friend who was hanging with a person who the participant believed “was not good for the goals that Marisa wanted to accomplish.” The participant then wrote, “I also felt that Marisa would eventually see that, so I distanced myself.”…”It took Marisa 1 year…she then came to see my opinion” (#15). A final theme of the resolved disputes was that sometimes participants considered the dispute resolved, but that their original viewpoints were maintained (18%). The friendship was maintained, but so were the original viewpoints. For instance, one participant wrote about socializing with a friend who spent the evening texting while ignoring his two male friends. Despite the disagreement he noted that, “I don’t really think we changed anyone’s view” (#24). Unresolved dispute themes. Three themes characterized the unresolved dispute narratives: attributed inabilities and motivations for not resolving the dispute, the role of insult, attack, and hurtful messages, and the engagement of minimal argumentation. Of the participants, 45% indicated that their disputes remained unresolved because of various inabilities of their friend or themselves to resolve the dispute. Participants wrote that their disagreements remained due to their stubbornness (“We were both stubborn”), jealousy (“My family hates that I am successful”), emotional involvement (“She was too absorbed in the situation to see clearly”), or close-mindedness (“My grandma was so close-minded, she would not listen”). Participants also cited the inability to be honest (“Due to his inability to be honest and straightforward with us we could not keep I him in the band”), or the ability to make credible arguments (I came at him with statistics…while he usually supported his arguments with “because I say so”). Some participants (15%) cited some type of argument or conflict management skill as a factor in their inability to resolve the dispute. Other participants (45%) indicated that insults, hurtful messages, emotional upset and/or anger played an important role in their unresolved disputes. For instance, one participant wrote: “She called me stupid for staying with him and said nothing good will come of our relationship. Her insults to my boyfriend, then to me, were very hurtful and I ended up ending our friendship” (#14). Another participant repeatedly described how she was upset by her friend ignoring her, and that “he didn’t know why I was so upset he was hanging out again with Drew (another friend), and that I should be happy that he is happy” (#18). Participants commented that sometimes they were too upset or their friend was too absorbed to gain a broader perspective on the situation. A third theme that characterized narratives of unresolved disputes was that the dispute became intractable because the participants could not discover a way to transcend their opposing standpoints. One third of the participants (36%) described that the differing perspectives that characterized the disagreement produced an inability to discover integrating moves. Disagreements remained intractable because of differing priorities or different perceptions on issues like safety (e.g., “It was really hard for us to settle this conflict because she is used to driving home under the influence and she felt like I had no right to take her keys,” #08). In other instances, the disagreement was over one friend disliking another friend’s boyfriend; the other friend was “blinded by love” or too absorbed” to see the situation the way the participant saw the situation. Importantly, in several instances, the participant believed that the friend’s boyfriend was violent or sexually manipulative but that the dispute remained unresolved because the participant could not convince the friend to leave the boyfriend. These participants typically indicated a recycling of initial standpoints. For instance, one participant wrote: “We weren’t able to resolve it because we weren’t on the same page. I was looking out for her best interests and she was looking for the satisfaction she got from that relationship in the moment” (#17). Other participants (18%) indicated that they couldn’t find a workable consensus (e.g., “The conflict was only temporarily fixed,” #16) or that initial similar viewpoints had shifted (e.g., “I decided I didn’t need a friend who I couldn’t count on to be there for me when I needed her,” #20). A few participants (9%) indicated that the disagreement was rooted in ideological or religious differences that prevented a resolution (e.g., “For her religion was the base for her argument which made it nearly impossible to change her mind… there was no middle ground,” #01). Some participants (18%) invoked Biblical, religious or spiritual perspectives to ground their standpoints. For instance, while one participant recognized that she had no response for her friends’ counterarguments, she nevertheless disagreed, saying that she had faith that God would take care of situations in which a woman’s life is in danger” (#09). Others relied upon religious principles like the Golden Rule to tell them how to manage the dispute. For instance, one participant wrote that she “personally judges everything I do and say by the Bible. If something goes against the Bible or my faith it is wrong.” This led her to seek solutions that would resolve the problem “peacefully” (#22). This analysis tested the general hypothesis that reflective reasoning is positively associated with argument skill. As predicted, reflective reasoning was positively associated with the use of arguments expressed in person-centered messages. That reflective reasoning was associated with person-centered regulative message strategies is consistent with previous research that used different measures of reflective reasoning (Kline & Chatani, 2001; Kline, 2006, 2010). However, that reflective reasoning was only weakly associated with integrative reasoning acts suggests that the differentiation of context, evidence, and reasoning that typifies advanced reflective reasoning practices may not be needed in proposing integrative ideas for settling disagreements among friends. Finally, and as expected, reflective reasoning was negatively associated with negative emotions in resolved dispute narratives, but positively associated with negative emotion expression in unresolved dispute narratives. 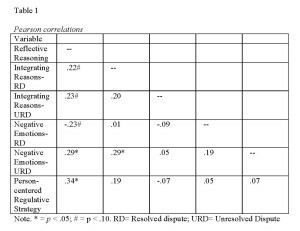 While these relationships were also weak in magnitude, both measures of negative expressed emotions were predictors of reflective reasoning in the regression analyses, suggesting that reflective reasoning is related to the expression of negative emotions in interpersonal disputes. Future research could focus on unpacking the relationship between the emotional experience of argumentation and reflective reasoning abilities. Taken together, the findings on the relationship of reflective reasoning to person-centered message strategies and integrating reasoning acts are significant, for interpersonal conflict and persuasion researchers have typically not used insights about proof, evidence, and argument in their studies, focusing instead on understanding individuals’ conflict styles and tactics, behavioral patterns in conflict, or the use of persuasive strategies. However, these findings suggest that understanding interpersonal disputes might profit by understanding how actors conceptualize the role of proof, evidence, and reasoning, and how reflective reasoning is associated with the way individuals go about managing their everyday disputes. Understanding what counts as the best proof and evidence to use may provide a basis for arguers to craft more individuated or person-centered arguments and to express fewer negative emotions in their disputes. These hypotheses about reflective reasoning and argument skill need to be tested with larger samples, and use more refined tasks and measures to assess reflective reasoning and argument skill. Argument scholars have not really settled on a conception of the cognitive and meta-cognitive abilities that are embedded in argument skill; this work could propel the creation of tasks for measuring these abilities. While the measure of reflective reasoning used in this study was adapted from King and Kitchener’s (1994) work on reflective judgment, a task and measure of reflective reasoning could be developed that would be easier to administer. In addition, argument skill could be assessed with dyadic interactional tasks as well as through oral interviews. Despite the field’s history of training debaters, designing interventions for teaching everyday argument skills remains to be achieved. Developing conceptions of argument skill would begin to correct these deficiencies in the existing literature on argument pedagogy. Argument scholarship has also tended to focus on argument practices in public and political contexts, ignoring the role of everyday argument and deliberation in the lives of neighbors, friends, group, and family members. The grounded theory analysis presented here of dispute narratives produces an exploratory set of insights about everyday argument that could stimulate future work. Five themes characterized the successful resolution of disputes: the role of understanding and listening to the other’s viewpoint, use of integrative proposals, skillful reasoning, taking time to reach a consensus, and sometimes agreeing to disagree. Three of these themes point to key argument skills, communication skills in listening and securing understanding, reasoning, and inventing integrative proposals, each of which may have distinct determinants. Perhaps the most intriguing theme that surfaced in the analysis of the resolved disputes was that several participants regarded their disputes as resolved when they had reached an understanding with the other person even though their opinions remained opposed. Some said they “agreed to disagree” because they prioritized their friendship. For these participants everyday argument was inextricably bound with whether the dispute had resulted in an interpersonal conflict that had implications for their friendship. This theme points to a conceptual problem that may play an important role in everyday interpersonal argument. Some years ago O’Keefe and Shepherd (1987; O’Keefe & Delia, 1982) analyzed the arguments of young adults and showed that an argumentative situation is characterized by at least two goal relevant choices; whether to acknowledge that arguers are in conflict with each other, and whether to advance their own position. Both choices are important in everyday argument, as the first represents the degree of interpersonal conflict, while the second represents the way in which one can integrate one’s own position with the other’s wants. Both choices reflect the resolved dispute theme of agreeing to disagree; that is, resolving to remove the conflict while not resolving the opinion opposition. The findings suggest that future work could advance argument studies by examining the structural relationship between these two types of choices. What, exactly, is the structural relationship between issue opposition and relational opposition? How can reasoning moves address both of these states or goals? Three themes characterized the narratives of friends regarding their unresolved disputes: the role of anger, emotional upset and hurtful messages, the inability of arguers to transcend opposing viewpoints, and the inability to come up with integrative proposals or reasoning to move beyond seemingly intractable opposition. Participants recognized that communication or argument skills as well as motivations like jealousy or stubbornness sometimes prevented them from resolving their disputes with friends. In addition, they acknowledged the role of emotional upset, anger or hurtful responses in stalling dispute resolution. Managing one’s own emotional response and learning how to handle others’ hurtful responses may be communication skills that should be studied in relation to argument skill. Finally, participants recognized their inability to invent integrative proposals or reasoning in disputes that contained seemingly irreconcilable viewpoints. Different values, shifting views, different priorities, and different perspectives were all named as reasons why friends could not transcend their differences. Personal motivations often trumped the often acknowledged superiority of logical force, and participants sometimes acknowledged their inability to be convincing with their friend. Unfortunately, nearly 20% of the unresolved dispute narratives concerned a friend’s inability to convince their friend to change unsafe behaviors or to leave a violent or manipulative boyfriend. This last theme highlights two areas for future research. First, young adults’ arguments often focused on issues surrounding dating and lifestyle issues, issues that can seriously affect their well-being. Argument scholars could contribute to the general community by determining best argument practices for helping young adults talk persuasively to each other about dating and health issues. Second, argument scholars could focus on identifying the strategies that help others accept positions that they already recognize as having logical force. For instance, are there particular argument practices that may help others change their views? In sum, the findings presented here provide evidence that the ability to reflect upon the adequacy of evidence and reasoning to justify one’s beliefs is positively related to the use of person-centered regulative message strategies. Argument pedagogy may profit from using findings such as these to enhance young adults’ everyday argument skills. Applegate, J. L. (1980). Person- and position-centered communication in a day-care center. In N. K. Denzin (Ed. ), Studies in Symbolic Interaction (Vol. 3, pp. 59-66). Greenwich, CT: JAI Press. Berkowitz, M., & Gibbs, J. C. (1983). Measuring the developmental features of moral discussions. Merrill-Palmer Quarterly, 29, 399-410. Berkowitz, M., & Gibbs, J. C. (1985). The process of moral conflict resolution and moral development. New Directions for Child Development, 29, 71-83. Burleson, B. R. (2007). Constructivism: A general theory of communication skill. In B. B. Whaley & W. Samter (Eds. ), Explaining Communication: Contemporary Theories and Exemplars (pp. 105-128). Mahwah, NJ: Erlbaum. Burleson, B. R., & Caplan, S E. (1998). Cognitive complexity. In J. C. McCroskey, J. A. Daly, & M. M. Martin (Eds. ), Communication and Personality: Trait Perspectives (pp. 230-286). Creskill, NJ: Hampton. Charmaz, K. (2006). Constructing Grounded Theory: A practical Guide through Qualitative Analysis. Los Angeles, CA: Sage Publications. Corbin, J., & Strauss, A. (2008). Basics of Qualitative research: Techniques and Procedures for developing Grounded Theory 3e. Los Angeles, CA: Sage Publications. Hample, D. (2005). Arguing: Exchanging Reasons Face to Face. Mahwah, NJ: Lawrence Erlbaum Associates. King, P.M., & Kitchener, K.S. (1994). Developing Reflective Judgment: Understanding and promoting Intellectual Growth and Critical Thinking in Adolescents and Adults. San Francisco, CA: Jossey-Bass Publishers. Kitchener, K.S., King, P.M., & DeLuca, S. (2006). Development of reflective judgment in adulthood. In C. Hoare (Ed. ), Handbook of Adult Development and Learning (pp. 73-98). Oxford, UK: Oxford Univ. Press. 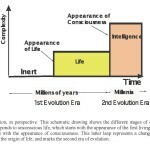 Kline, S. L., & Chatani, K. (2001). Social perception and message awareness as correlates of person-centered regulative messages. Communication Research Reports, 18, 274-284. Kline, S. L. (2006). Deliberating about behavior change: The role of message monitoring in person-centered regulative messages. In P. Riley (Ed. ), Engaging Argument:Proceedings of the Alta Argumentation Conference (pp. 578-588). Washington, DC: NCA publications. Kline, S. L. (2010). Creating discursive space to consider incongruous perspectives: The role of dialogical mechanisms in argument. In D. S. Gouran (Ed. ), The Functions of Argument and Social Context: Proceedings of the Alta Argumentation Conference (pp. 250-258). Washington, DC: NCA publications. Kline, S.L. & Delia, J.G. (1990). Reasoning about communication and communicative skill. In B.F. Jones and L. Idols (Eds. ), Dimensions of Thinking and Cognitive Instruction, Vol 1 (pp 177-207). Hillsdale, NJ: Lawrence Erlbaum. Kuhn, D. (1991). The Skills of Argument. Cambridge, UK: Cambridge Univ.Press. Kuhn, D. (2005). Education for Thinking. Cambridge, MA: Harvard Univ.Press. Kuhn, D., Goh, W., Iordanou, K., & Shaenfield, D. (2008). Arguing on the computer: A microgenetic study of developing argument skills in a computer-supported environment. Child Development, 79(5), 1310-1328. O’Keefe, B. J., & Delia, J. G. (1982). Impression formation and message production. In M. E. Roloff & C. R. Berger (Eds. ), Social Cognition and Communication (pp. 33-72). Beverly Hills, CA: Sage Publications. O’Keefe, B.J., & Shepherd, G.J. (1987). The pursuit of multiple objectives in face-to-face persuasive interactions: Effects of construct differentiation on message organization. Communication Monographs, 54, 396-419. Taylor, T. T. (1992). Mutual Misunderstanding: Skepticism and the theorizing of Language and Interpretation. Durham, NC: Duke Univ. Press. Van Eemeren, F. H., & Grootendorst, R. (2004). A Systematic Theory of Argumentation: The Pragma-dialectical Approach. Cambridge, UK: Cambridge Univ.Press. Walton, D. N. (1989). Informal Logic: A Handbook for Critical Argumentation. Cambridge, UK: Cambridge Univ. Press. This is a true story. Sam and Evan are seventh grade identical twins, who are motivated, intelligent, handsome, and star athletes in hockey, baseball, and soccer. They are being raised by their grandparents, their parents having passed away when the twins were four years old. They love and look up to their older brother, Max, who dropped out of OSU earlier this year with a lack of focus and poor grades. Last week Max dropped by the family home, and while with the family, listened as the twins discussed their recent achievements at school. “Haven’t they learned yet that middle school grades don’t count?” Max proclaimed with a laugh. Later in the conversation, Max told them about his part time job at a local computer store, a job he’s wanted for a long time. He commented that he gets a 15 minute break, but on a recent one, his boss entered the break room and requested that everyone return to their checkout positions to handle the long lines that had formed. Max commented to the family that he looked at his watch, determined that he had 5 more minutes to his break and stayed behind, to make sure he got his full break. Having heard Max’s comments, his grandparents became concerned about Max’s influence on his little brothers. Please write down what you think Max’s grandparents should say to the entire family at that moment. Write down the actual words you think they should say, just as though they were engaged in conversation. Now I would like for you to think of a good friend that you have, and to a time in which you had an honest disagreement with your friend about an issue. You and your friend had different points of view about a subject or issue. Yet you and your friend were able to resolve this difference of opinion with communication, reasoning and argument. Can you tell me about this instance? You can write your account like a story if you want – what I’m interested in is learning what the different points of view were, and exactly how you went about resolving the difference of opinion. What specific arguments or reasoning were used to resolve the difference of opinion? What did you say? What did your friend say? Did you or your friend change his/her view to resolve this difference of opinion? Finally, I would like for you to think of a good friend that you have, and to a time in which you had an honest disagreement with your friend about an issue. You and your friend had different points of view about a subject or issue. But this time you and your friend were NOT able to resolve this difference of opinion with communication, reasoning and/or argument. Can you tell me about this instance? You can write your account like a story if you want – what I’m interested in is learning the different points of view, and what specific arguments or reasoning were used to try to resolve the difference of opinion? What did you say? What did your friend say? Why do you think you were not able to resolve the difference of opinion?